The Tisch name is hard to miss in New York City. Strolling the campus of NYU, one comes across the Tisch School of the Arts, Tisch Hall, and Tisch Hospital. Visiting Central Park, you can enjoy the Tisch Children’s Zoo. Then taking a break in Washington Square Park, you can relax by the Tisch Fountain. While the family is well-known for its business savvy, people also associate the Tisch name with philanthropy. The Tisch story begins with his paternal grandparents who immigrated from Russia to Brooklyn, where they raised Bob and Larry Tisch, the legendary duo who parlayed the purchase of a New Jersey hotel into what today is a hugely successful conglomerate, the Loews Corporation. “It was a genuine ‘American dream’ story,” says Andrew, the first of four sons born to Larry and his wife, Billie. The firm is one of the largest diversified holding companies in the United States, with interests in commercial insurance, offshore drilling, oil and natural gas production, pipelines, and luxury lodging. Following in the footsteps of their parents, Andrew, his brother Jim, and cousin Jonathan run the company today. In an unusual arrangement, they share the top spot: Andrew and Jonathan serve as co-chairman of the board, and Jim is president and CEO. Under their leadership, revenues for the New York City–based company reached $14 billion in 2011. Tisch meets with his brother Jim at Loews headquarters. 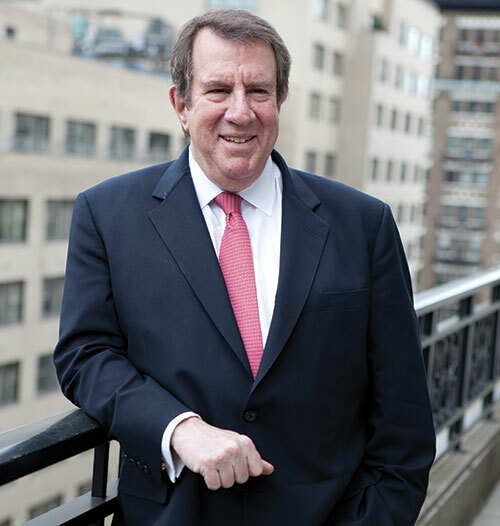 A regular reunion attendee, class volunteer, and a past member of the HBS Visiting Committee, Tisch currently serves on the Board of Dean’s Advisors. His strong interest in strategic philanthropy led him to get involved with the School’s Social Enterprise Initiative. “Nobody ever gives away their money as intelligently as they make it,” observes Tisch, who helped design and launch an HBS conference focused on helping participants make effective philanthropic decisions. As for his own philanthropic strategy, Tisch likes to go against the grain. After September 11, 2001, he mobilized New York City’s entertainment, cultural, and sports outlets to donate tickets to victims’ families, ultimately serving more than 85 percent of the families. Seeing the trash that covered the field where his son played football led him to get involved with New York’s City Parks Foundation, an organization that he chaired for five years. And, inspired by his wife, Ann, Tisch has supported public K-12 education. Politically, he cofounded No Labels, a nonpartisan group focused on restoring fiscal integrity in the US government. Whether it is nature or nurture, clearly Andrew Tisch’s contributions to society live up to the ideals instilled in him by his forebears. Several months after their father died of cancer eight years ago, the Tisch brothers split his office into two, each taking half. “Sometimes when I’m struggling with an issue—whether it is business or personal,” he says, “I find that if I sit here long enough, I will remember the lessons that my father taught me.” And thus the vitality of a powerful family legacy continues.